March is a time of change in the garden. 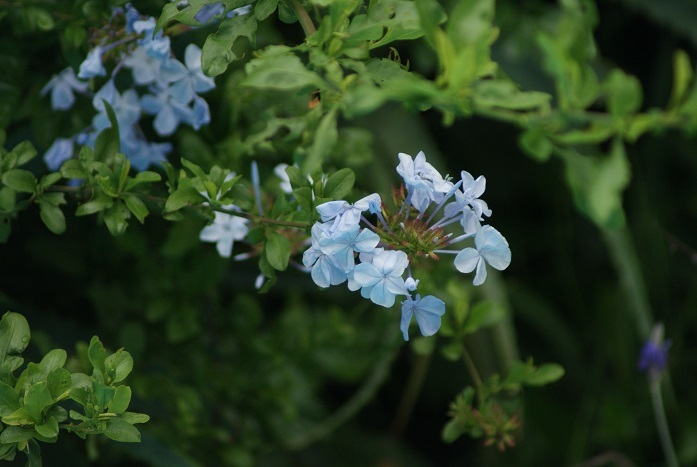 The small amount of rain that fell during the month has revived the trees and grass, while encouraging the blooming of the Plumbago. It is also the time when the natural grasses go to seed, providing a nutritious alternative to the seeds I put out regularly. 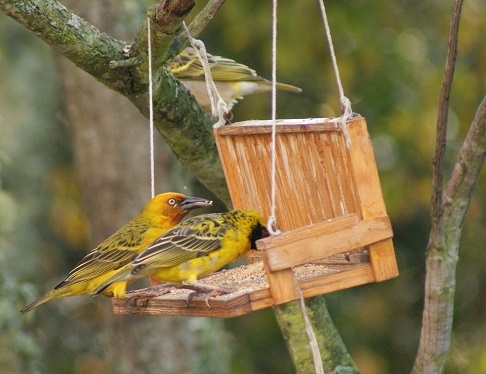 Weavers are losing their bright breeding plumage and have suspended their nest-building activities until spring. Not so the Olive Thrushes, of which I have counted up to six visible at a time, for at least one pair is still nesting. You will have to look at this photograph very carefully for the patch of orange on top of the dark mass of the nest! Speckled Mousebirds scour the bushes for tiny berries, leaves, flowers and nectar, while Laughing Doves peck over the recently cleared compost area as well as the masses of tiny figs from the Natal Fig tree that have dropped onto the road below that are crushed by passing vehicles. 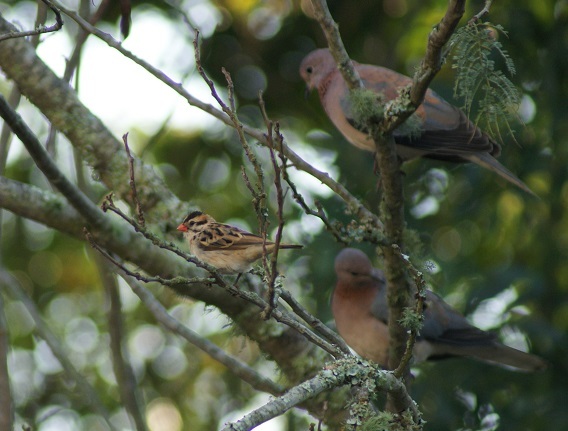 The clusters of figs also attract African Green Pigeons and Redwinged Starlings among a host of other birds. 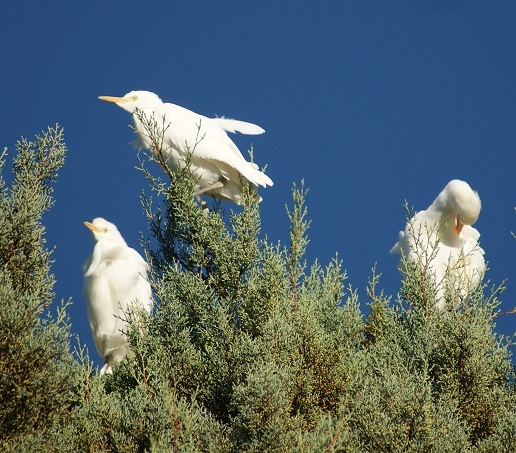 Cattle Egrets roosting in the CBD continue to experience hard times: two tall trees have recently been removed from the garden of a complex of flats because residents complained about the noise they make as well as the smell of their droppings. Several have taken to perching atop a neighbour’s tall tree in the late afternoons, but are not (yet) overnighting there. Finally, of course my camera wasn’t at hand when we witnessed the very unusual sight of a Cardinal Woodpecker drinking and bathing in the bird bath only a short distance from where we were sitting! Note: Click on the photographs if you want a larger view. 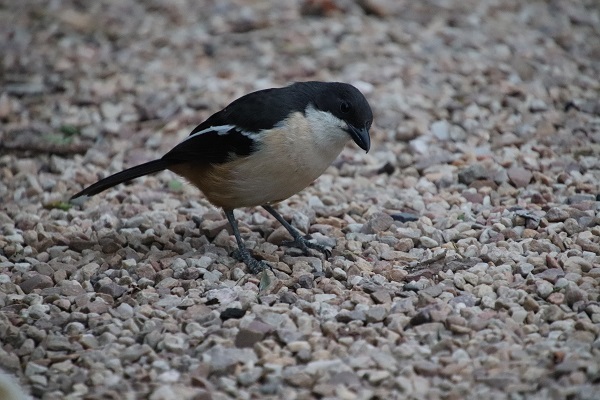 A Southern Boubou looking quizzically at the camera before resuming its search between the gravel stones. 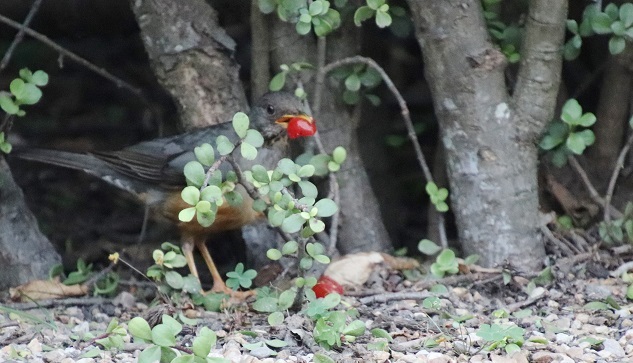 An adult Olive Thrush that seized upon a baby tomato at the base of the Spekboom hedge, crushed it in its beak, and then fed it to the spotted juvenile following it around. 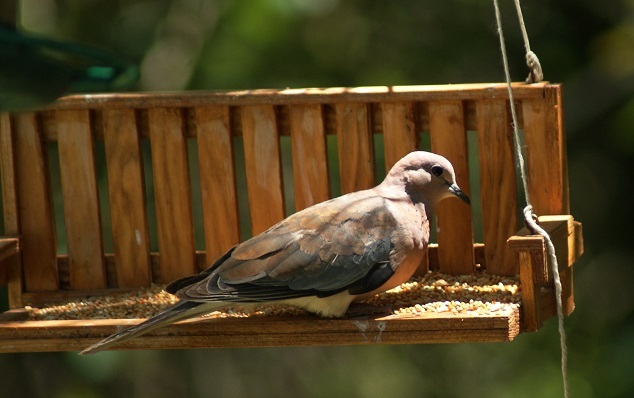 This Laughing Dove looks as if it has just woken up! 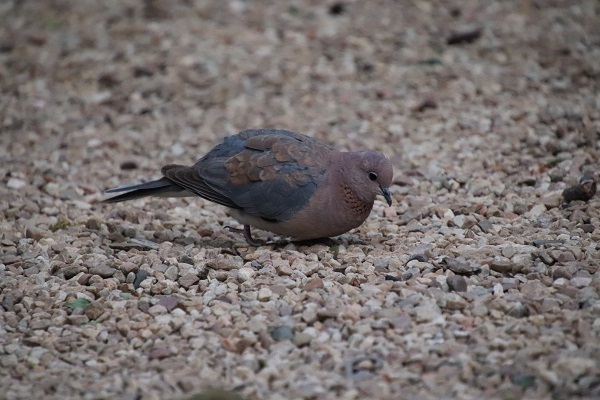 A more alert Redeyed Dove stretching to pick up a tiny seed lodged between the gravel. 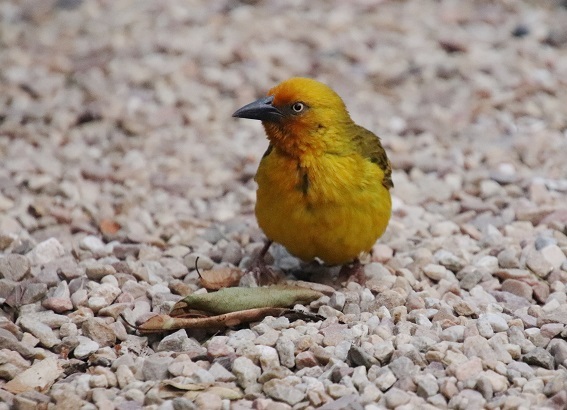 This brightly coloured Cape Weaver flew down to see what may be hiding behind the leaves. 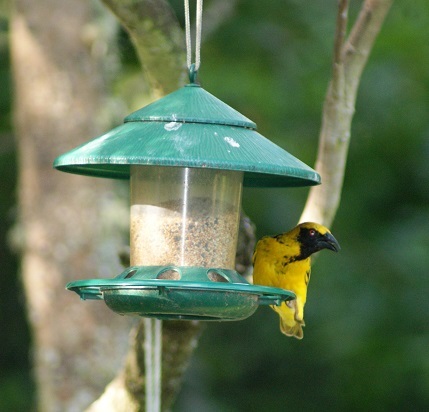 As did a sharp-eyed Southern Masked Weaver. You can tell the sun had risen by then! 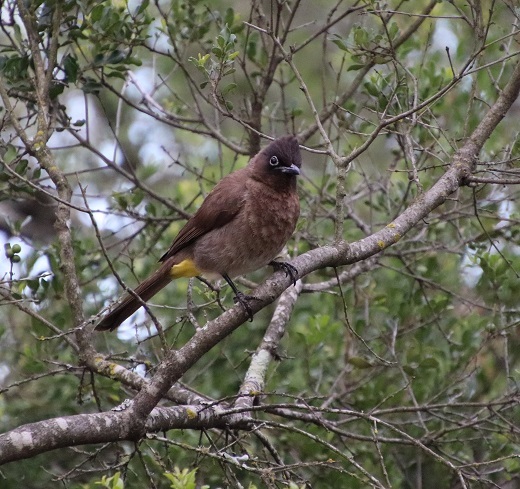 While a curious Cape Bulbul watched the proceedings from on high. This month has been cold and very windy at times. What remains of the lawn is covered with the dried up leaves from the Cape Chestnut and the many Pompon (Dias cotonifolia) trees. The sun rising later and remaining lower above the horizon for longer has meant that the front garden remains in full shade until well past mid-morning. Generally, this means that the birds seek the highest branches to perch on while the sun warms them up and only come down to inspect the seed I have put out much later. 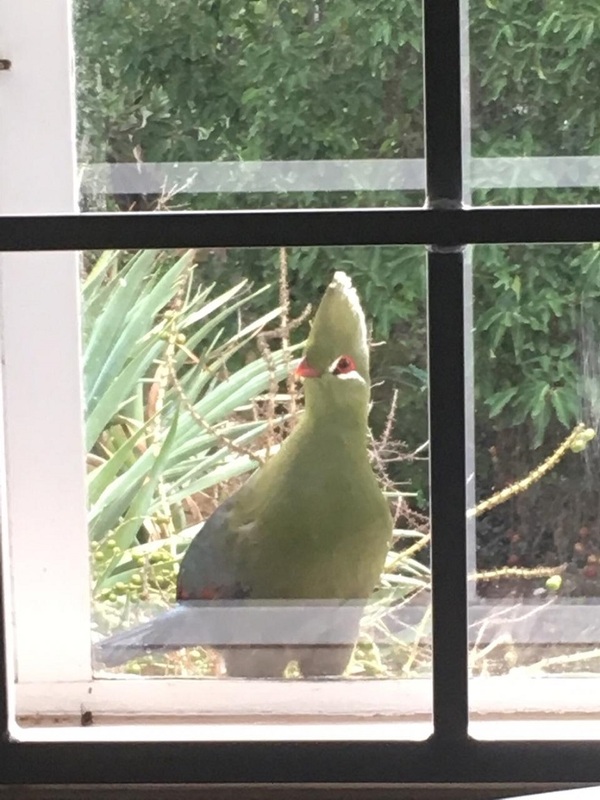 This has caused me to change my routine too: I only provide seed at mid-morning, when I take a break for a cup of tea and also try to find warmth in the weak sunlight. 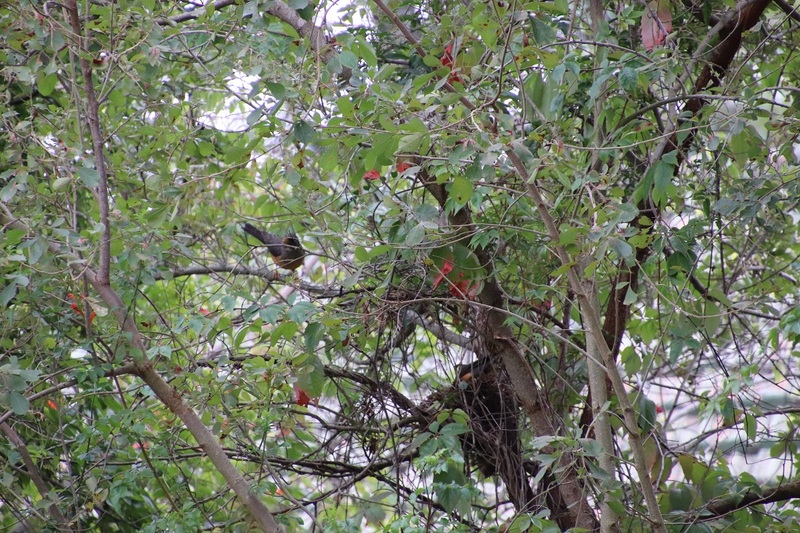 Although there is no fruit in the garden, there must be something to eat for a flock of at least a hundred Redwinged Starlings wheel about the suburb daily, flying from one garden to the next and filling the air with their mellifluous sounds. 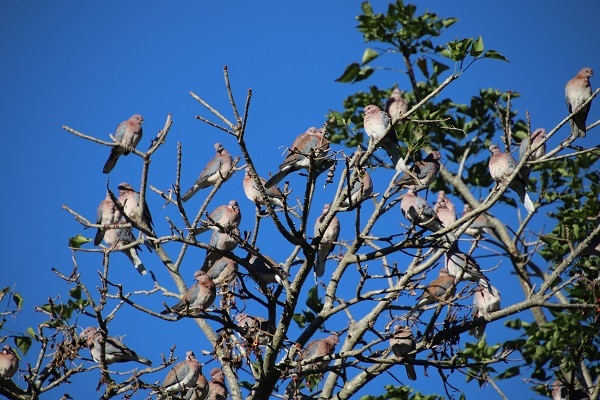 A flock of a similar size of Laughing Doves gather in the Erythrina caffra in the back garden almost as soon as the rays of the sun reach its uppermost branches. 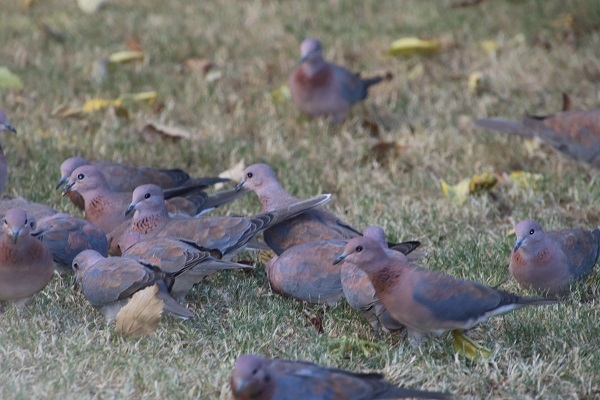 They gradually work their way towards the front garden, fluttering from one tree to another until one or two finally pluck up the courage to settle down to test the crushed mealie seeds sprinkled on the patches of lawn beaten hard and bare by their myriad feet. I can almost tell the time they will arrive: fifteen to twenty minutes after I have sat down. 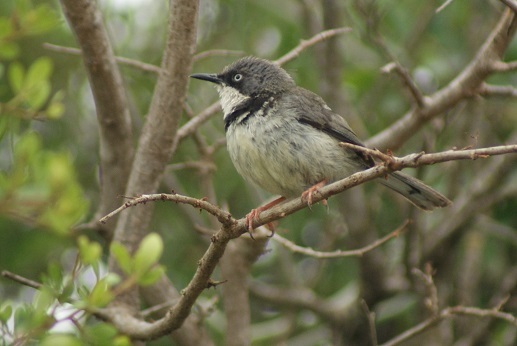 A pair of Blackeyed Bulbuls usually arrive mid-morning to investigate what is on offer – cut apples are a favourite. Their cheerful calls from within the yellowing foliage of the Pompon trees are always welcome. 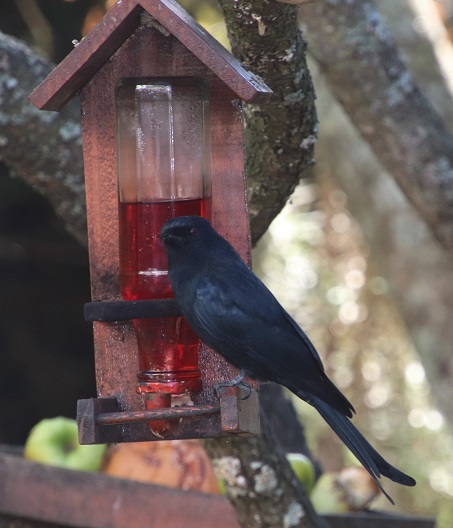 With most of the aloes having finished blooming, the nectar feeder has become more popular again, attracting the Amethyst Sunbird, Forktailed Drongos, Cape Weavers, and Blackheaded Orioles among others. In the back garden, the Erythrina caffra (Coral tree) is sporting clusters of seedpods split open to reveal their coral-red seeds which, in due course, fall to the ground. These small, shiny seeds marked on the one side with a black spot are also known as lucky beans. 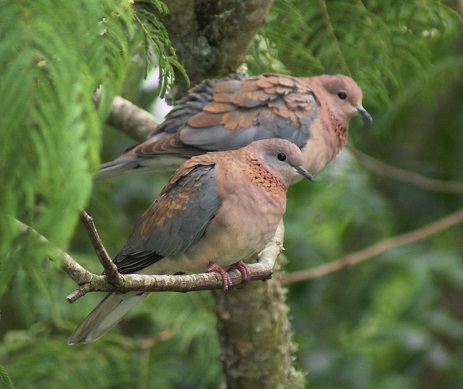 Laughing Doves and Forktailed Drongos perch in the high branches to catch the warmth of the early morning sun and again in the late afternoon. 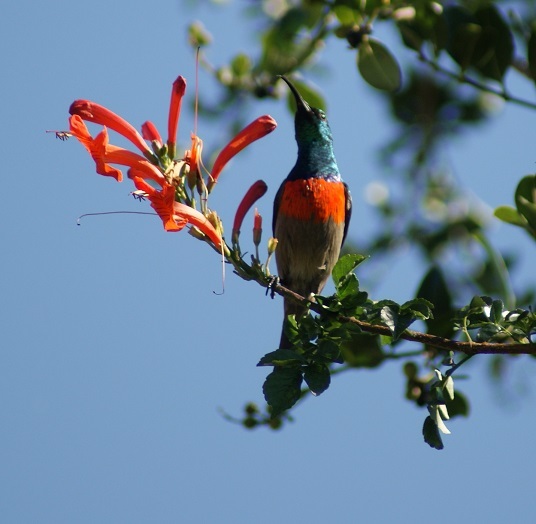 The Black Sunbirds and Greater Double-collared sunbirds as well as Blackcollared Barbets, Blackheaded Orioles, Cape- and Village Weavers as well as Redwinged starlings are regular visitors too. I have mentioned before that the name Erythrina, originates from the Greek word erythros meaning red and alludes to the bright red flowers and seeds. Caffra is derived from the Arabic word for an unbeliever, and as used in older botanical works generally indicates that the plant was found well to the south of the range of Arab traders, that is, along the [south] eastern seaboard of South Africa. Carl Thunberg, known as the father of South African botany, gave the names in 1770. 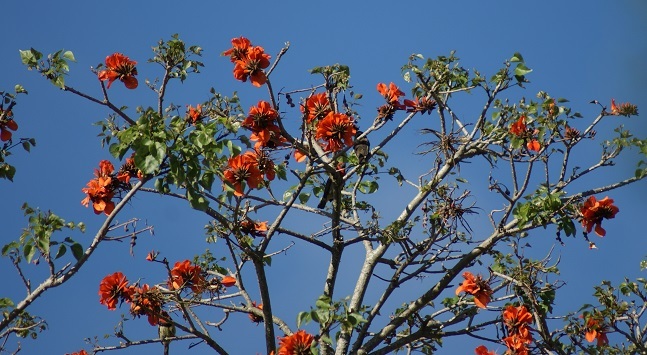 In parts of South Africa, both the Erythrina caffra and the Erythrina lysistemon are regarded as a royal tree; much respected and admired in Zulu culture and believed to have magic properties. Specimens have been planted on the graves of many Zulu chiefs. In parts of the Eastern Cape, local inhabitants will not burn the wood of Erythrina caffra for fear of attracting lightning. 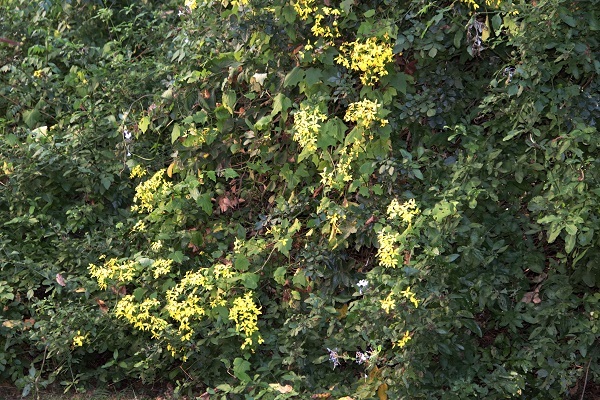 The indigenous Canary Creeper (Senecio tamoides) has come into full bloom, covering the trees and shrubs with a canopy of bright golden yellow flowers that attract the Barthroated Apalis, Cape White-eyes and a variety of butterflies. These flowers also exude a delightful aromatic scent that adds to the pleasure of being in the garden. 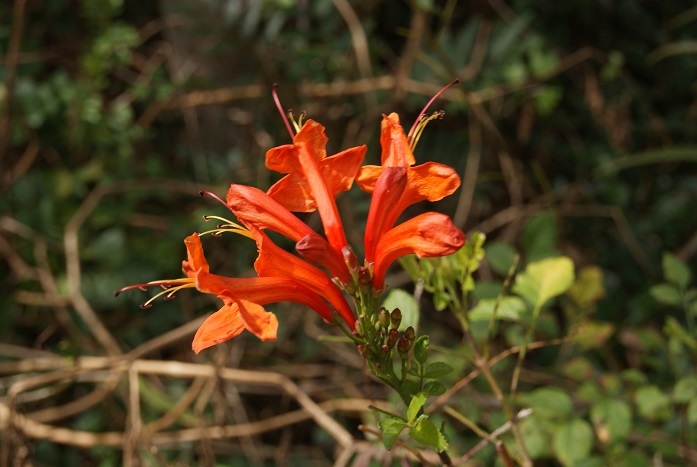 Equally beautiful are the bright orange tubular flowers of the Cape Honeysuckle (Tecoma capensis) that are coming into bloom. These attract the nectar-feeding Amethyst Sunbirds, Greater Double-collared sunbirds, Streaky-headed Seedeaters, Cape Weavers and Village Weavers as well as several butterflies. 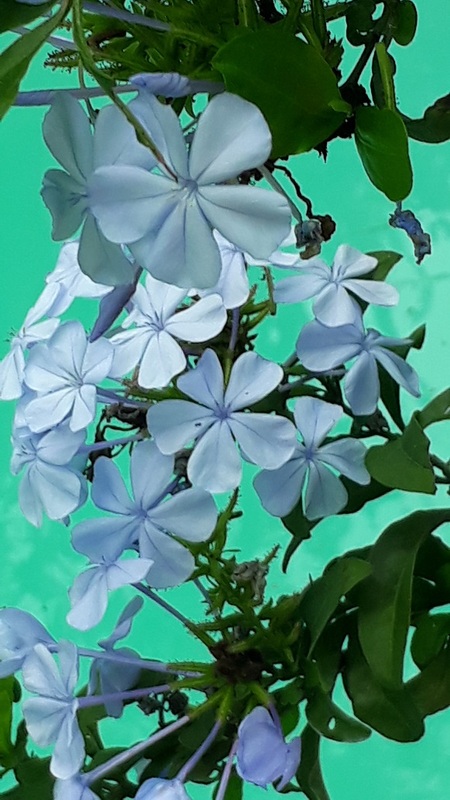 Trusses of the beautiful pale blue Plumbago (Plumbago auriculata) flowers are also starting to appear. 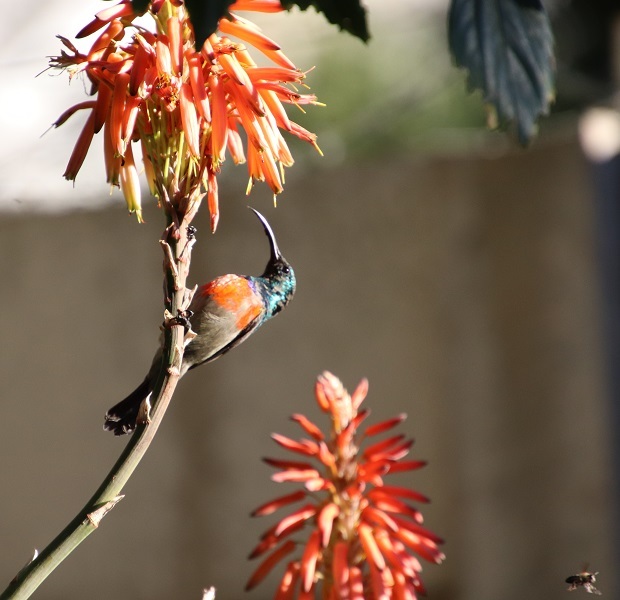 The first aloes are coming into bloom too and are visited regularly by the Amethyst Sunbirds, Greater Double-collared Sunbirds, Streakyheaded Seedeaters, Cape Weavers, Village Weavers, Blackheaded Orioles and Cape White-eyes. This has been an excellent month for watching birds in our garden. However, in between entertaining friends and family, celebrating Christmas, and sneaking in a visit to the Addo Elephant National Park before the year ended, there have not been many photographic opportunities, and so you may have seen some of these pictures before. 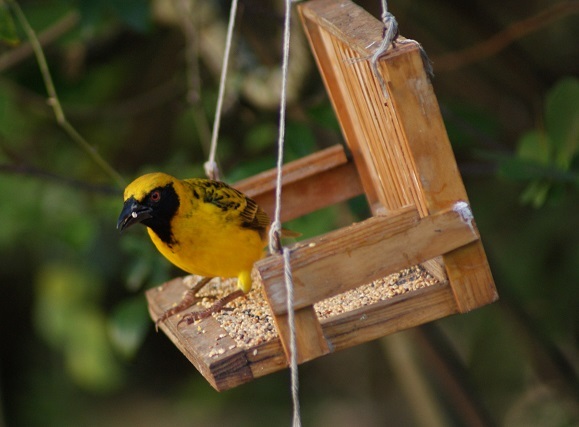 Village Weavers have continued to entertain us with their cheerful chattering, bright yellow plumage and their constant bickering at the feeding stations. 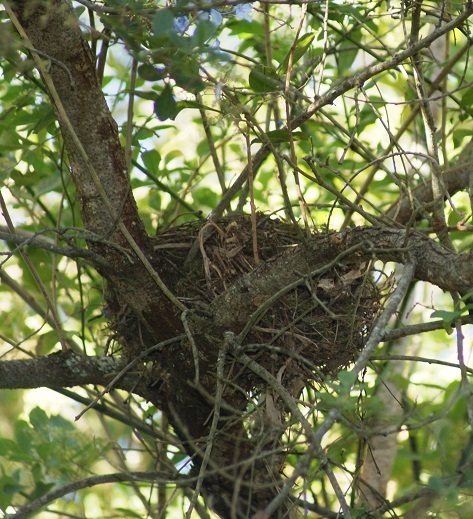 Despite several nests having been crafted all over the garden, few have actually been used for breeding. 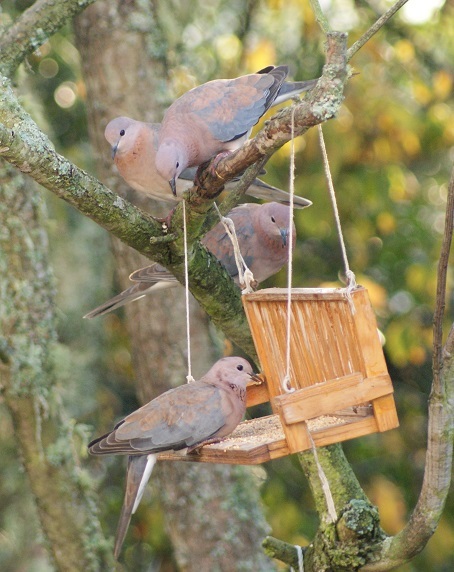 Laughing Doves are regulars too: they queue up on the telephone cable in the mornings, waiting for me to scatter seed on the lawn. They gradually move from the cable to the trees, coming ever closer until they alight cautiously. The flock (for there are many of them now) rise in an audible ‘whoosh’ at the slightest movement or sound that triggers their alarm system, only to return moments later. 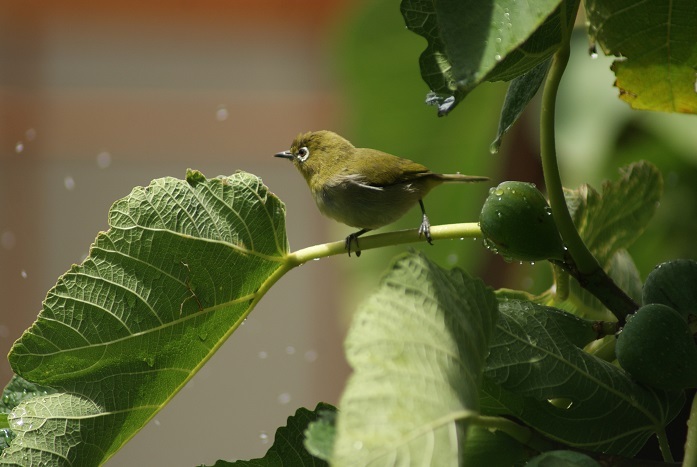 Cape White-eyes are among the first garden birds to stir before first light. They are making a meal of the ripening plums at the moment! These are figs in the picture below – I haven’t one of them gorging on the plums to show you. The Greater Double-collared Sunbird has been making ‘guest appearances’ this month as there is plenty of other food about. I always enjoy the metallic sheen of its feathers. After a brief absence, it feels good to have the Barthroated Apalis back. What an enjoyable month for watching garden birds! The on-going drought means that the food I put out is appreciated by the locals – they have been through a lot of fruit and seed this month! The latest addition to the feeding table are seed cakes which Ceridwen from next door and a friend made for me over the weekend. 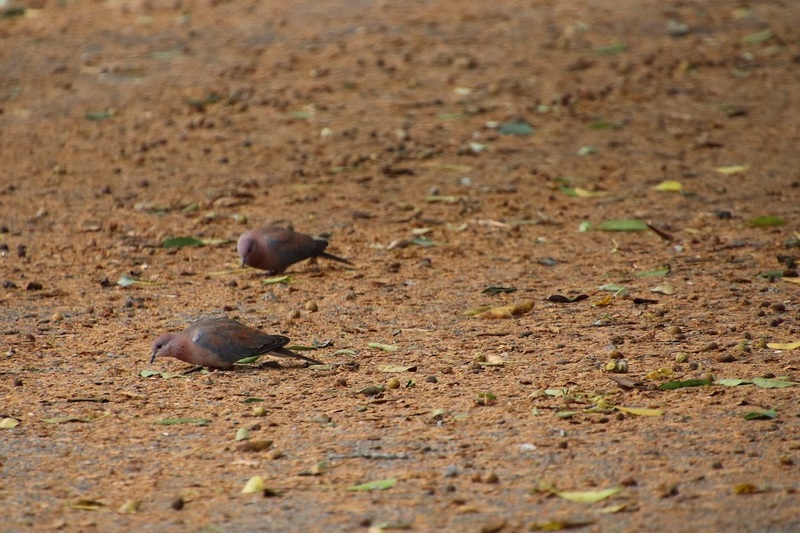 These have been devoured by the Fiscal Shrikes, Blackcollared Barbets, Boubous, Blackheaded Orioles – and even the Laughing Doves. Morrigan’s feeder is a popular haunt in the early mornings and even has queues of birds either waiting their turn or preparing to muscle in on the fine seed I put there. No Lanner Falcon this month, but I had a wonderful view of a Black Harrier being mobbed by a pair of Pied Crows all the way across the garden until they disappeared into the bright sun already lowering in the sky. I have often noticed a Black Harrier perched on telephone wires on the hill above our house over the past few weeks. Other welcome newcomers to this month’s list include a Hoopoe, a couple of Spectacled Weavers and Pintailed Whydahs. 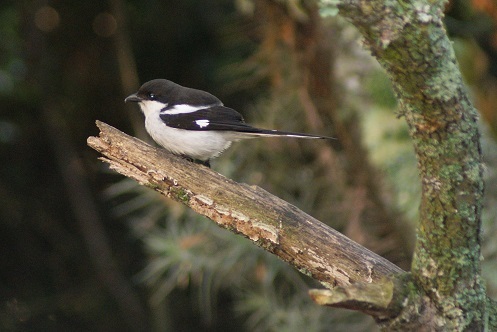 The latter are still in their winter tweeds, although a few are beginning to show a paler breast – the beginnings of their summer sartorial splendour of black and white tuxedo. The Cape Weavers are showing their breeding blush of colour around their faces – some are almost a deep russet. With winter nearing its end (according to the calendar, if not the current temperature) Village Weavers are also coming out in their breeding colours. 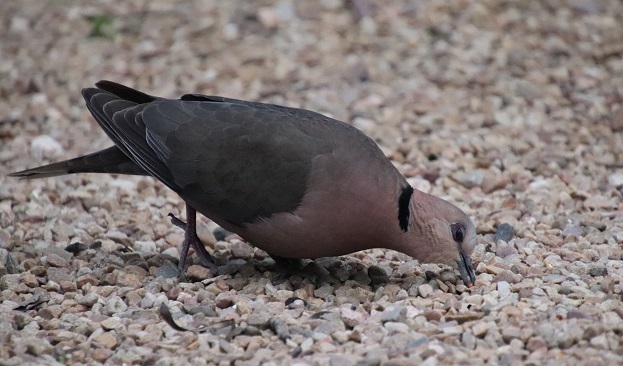 It is not surprising that Laughing Doves have been the dominant birds in our garden this month: their numbers have increased over the years and they are always among the first to feed on the coarse maize seed I scatter on the lawn in the mornings. It takes about twenty minutes from the time of doing so until first one or two come down, soon to be followed by the rest of the gang that have flown ever closer to the source of the food – from the telephone cable in the back garden, to the Cape Chestnut, to the Wild Plum (perching ever lower down) until over thirty of them make short work of the maize. A few adventurous ones perch on Morrigan’s feeder to get the fine seed and some manage to hang onto the seed house for long enough to get some of the seed there. Nesting time is far from over: the Lesser-striped Swallows completed their mud nest outside our front door – with the result we tend to use either the kitchen door or the side door to give them some peace. The White-rumped Swifts do not have any compunction about trying to usurp this nest for their own progeny and so the swallows have had to devote a lot of energy towards defending their home territory. Careful observation of a pair of Olive Thrushes finally revealed their nesting site right next to the garden path! 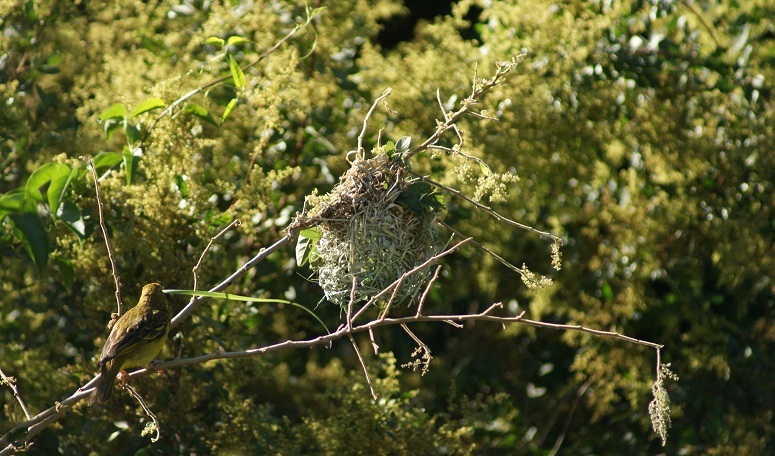 Weavers have also continued building nests around the garden. I thought I would compare this month’s bird list with that of February last year. Seven species have not been seen, while thirteen others have come to the garden that were not seen last year.